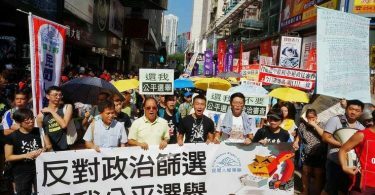 Hundreds of demonstrators gathered on Sunday to march from Causeway Bay to Admiralty in protest of the government’s decision to bar mostly pro-independence candidates from running in September’s legislative elections. 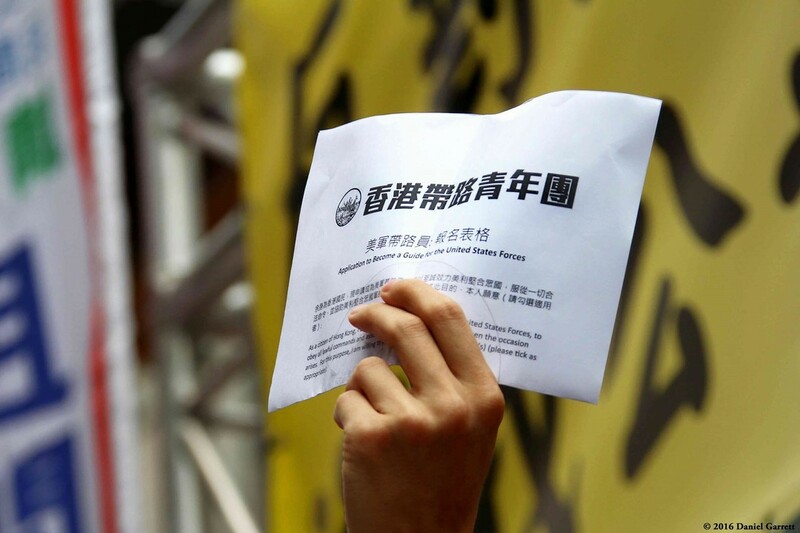 Organisers, the Civil Human Rights Front, said the move amounted to political censorship. 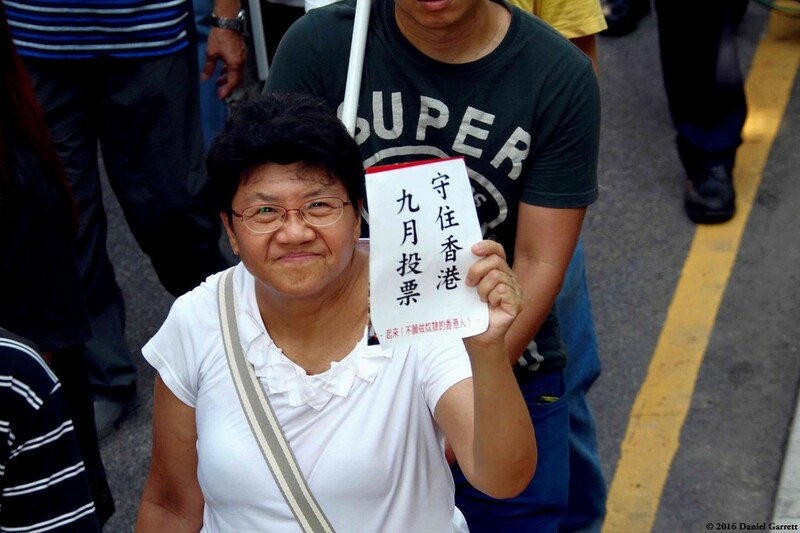 They said more than 1,300 took part in the rally, though police put the turnout at 760 at its peak. 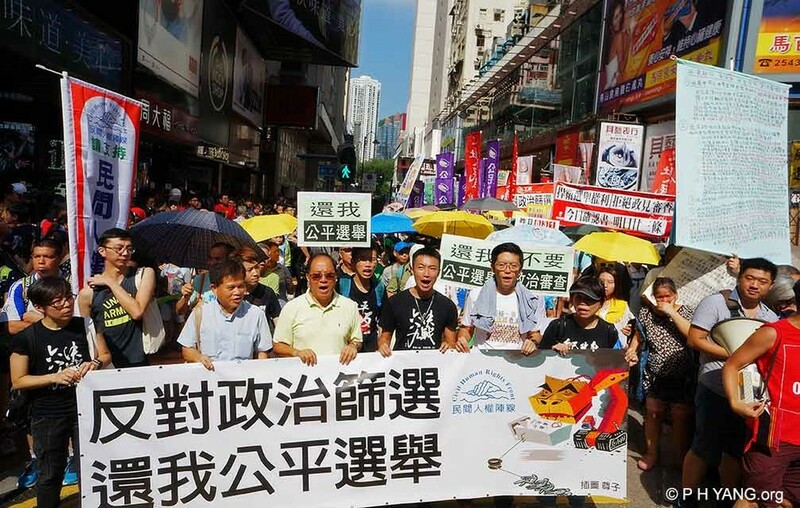 Protesters, including localist advocate Nakade Hitsujiko on the right. Photo: Dan Garrett. 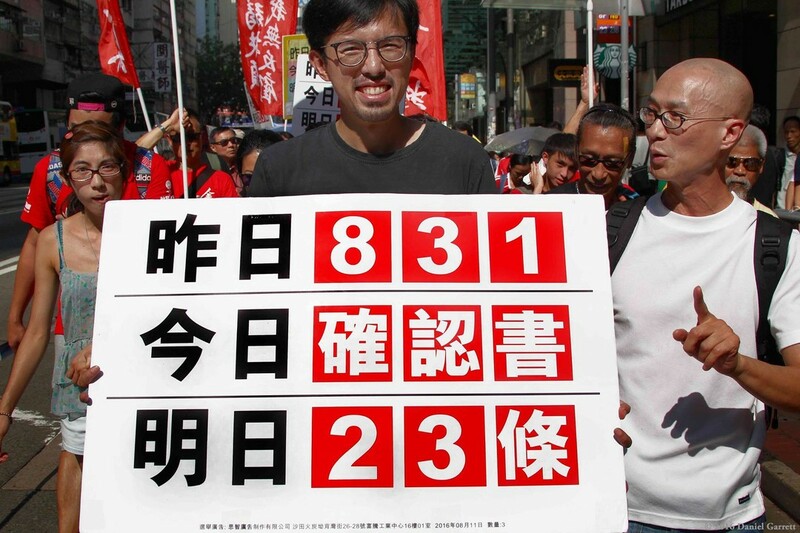 Avery Ng Man-yuen holds a sign which says “Yesterday is 831, today is the declaration, and tomorrow is Article 23,” in reference to the August 31 political reform decision by the central government in 2014, effectively ruling out full democracy and which partly led to the pro-democracy Occupy protests. 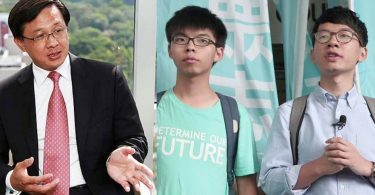 Ng’s sign also references the declaration form which prospective candidates running in the September Legislative Council election were asked to sign a form confirming that they upheld the Basic law. Photo: Dan Garrett. 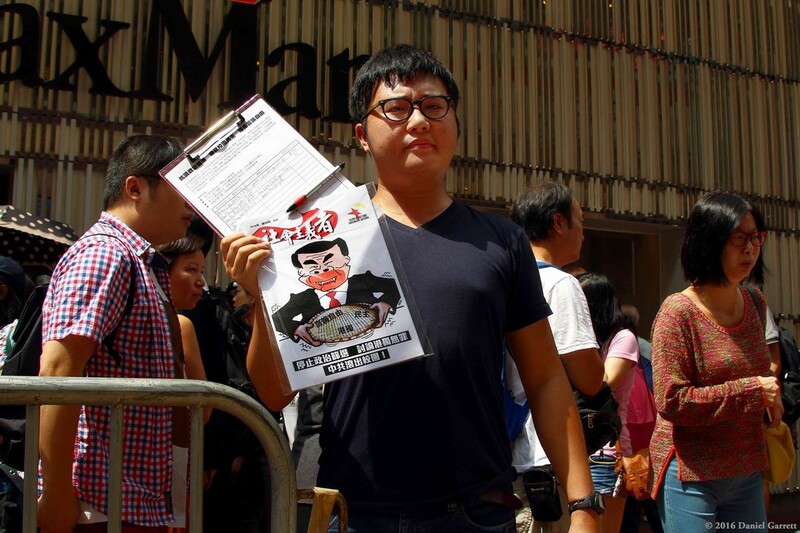 A man holds up a form and a cartoon of Chief Executive Leung Chun-ying. Photo: Dan Garrett. 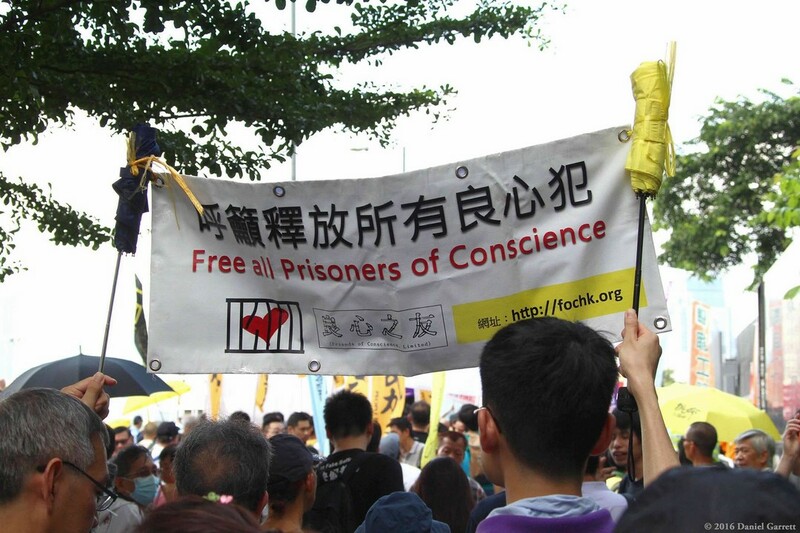 Protesters demands that mainland authorities, “free all prisoners of conscience.” Photo: Dan Garrett. A form to “become a guide for the United States forces.” Photo: Dan Garrett. “Say no to political censorship.” Photo: Dan Garrett. 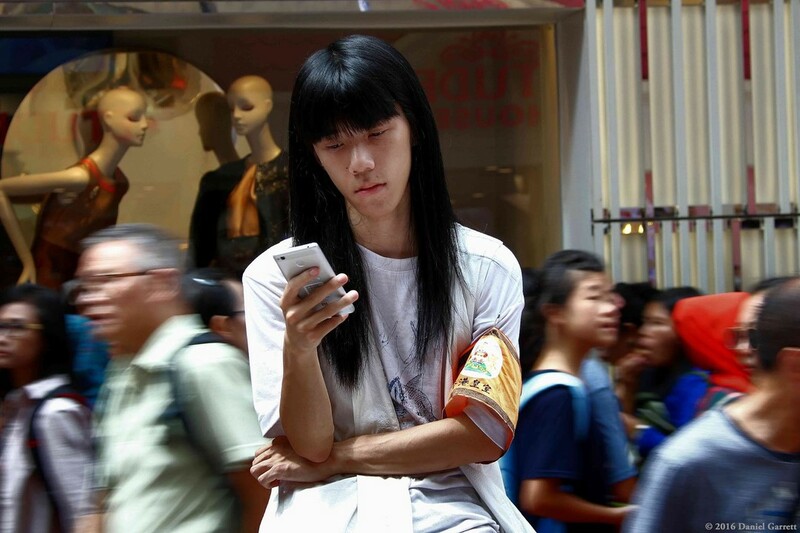 Nakade Hitsujiko checks his phone during the protest. Photo: Dan Garrett. 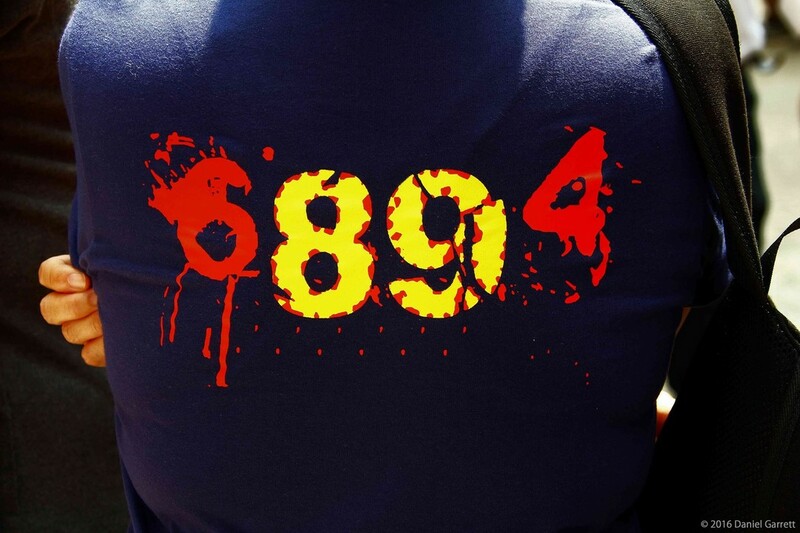 A shirt with numbers which correspond to June 4, 1989, the day of the Tiananmen Massacre. 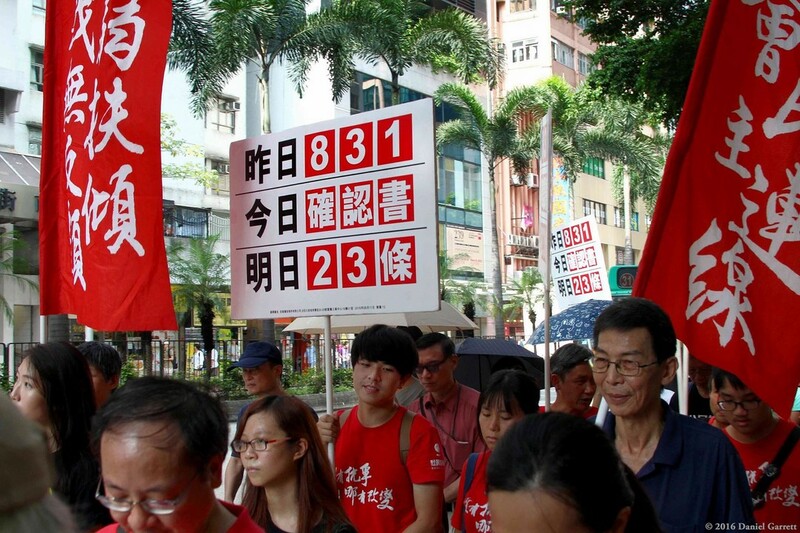 A group of protesters representing the pro-democracy League of Social Democrats. Photo: Dan Garrett. 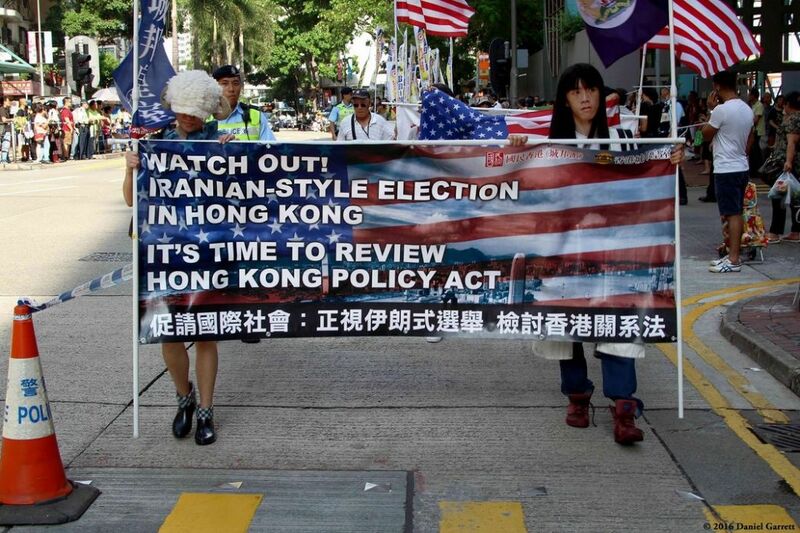 An man holds up a sign: “There has not been censorship of candidates in the past. There is no law, no god. The Registrations and Electoral Office is violating the law. Hong Kong back to the UK.” Photo: Dan Garrett. 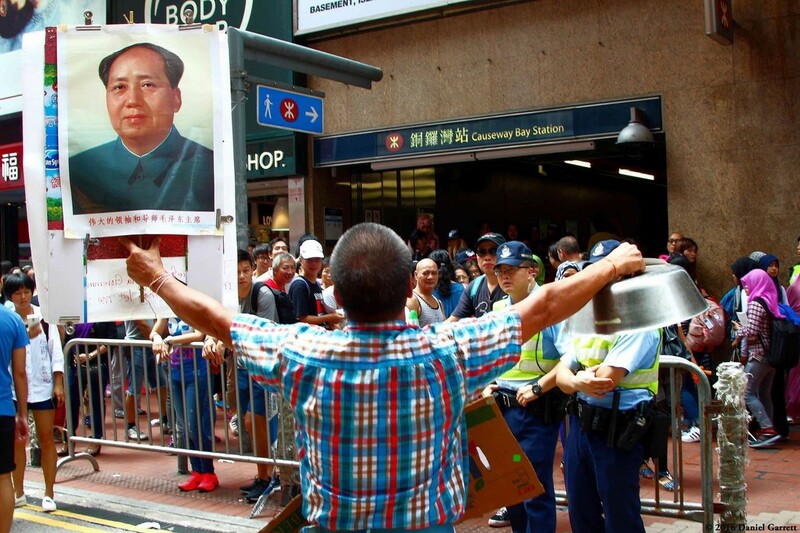 A man holds up a portrait of Mao Zedong as two police officers stand nearby. Photo: Dan Garrett. 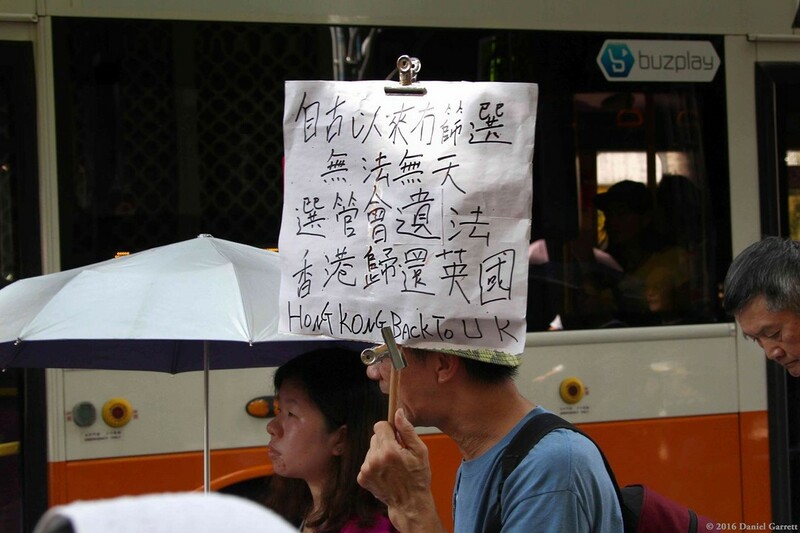 A woman holds up a sign saying “Defend Hong Kong, vote in September.” Photo: Dan Garrett. 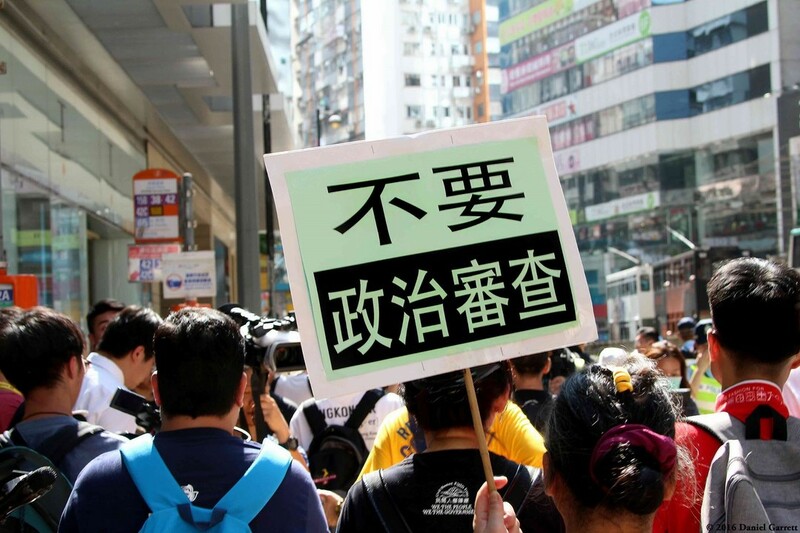 The Civil Human Rights Front with a sign saying “Against political candidate censorship, give me back fair elections.” Photo: P.H. Yang.